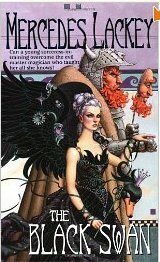 My experience with Mercedes Lackey’s books has been uneven over the years, so I’ve typically been reluctant to try a new series of hers without some kind of recommendation. In this case, it was a leap of faith, since it is a retelling of the Swan Lake story and I thought it was an extension of her other fractured fairy tale series, The Elemental Masters. After his wife’s untimely death, a powerful sorcerer dedicates his life to seeking revenge against all womankind. He turns his captives into beautiful swans–who briefly regain human form by the fleeting light of the moon. Only Odette, noblest of the enchanted flock, has the courage to confront her captor. But can she gain the allies she needs to free herself and the other swan-maidens from their magical slavery? A monumental tale of loyalty and betrayal, of magic good and evil, of love both carnal and pure, and of the duality of human nature, The Black Swan is a rich tapestry which is sure to become an all-time masterpiece of fantasy. She was tired of rebuffs when she expected praise; there must be something she could do to change the situation. For the past few days, she had devoured book after book in the library, sitting next to an open window overlooking the gardens in order to enjoy the summer evenings while she sought for a new direction to her work. She had to have something to show her father, for he kept up a steady inquiry into the progress of her studies. That inquiry would become painfully embarrassing soon; traces of sardonic amusement already showed in his voice. Her problem was that she couldn’t think of any course of study that would please him. Finally, she tried a different approach to the problem. She cleaned off a wax tablet and sat in her favorite seat with it in her lap and a stylus in her hand, a single lamp burning above her head. She divided the tablet in half with a line scribed in the wax; on the right, she inscribed a word or symbol that stood for a spell she had mastered that had brought forth a word of praise, while on the left, similar signs for spells that had brought indifference, or worse, veiled disapproval. The transformation from slavish and devoted daughter to woman who has her own agenda was thoroughly enjoyable. Swan Lake the ballet does not have a happily ever after, though the way Lackey develops even that element is consistent with the fully fleshed characters she develops over the course of the novel. I can happily recommend this book to anyone interested in an updated take on an old fairy tale that doesn’t end in quite the bloody mess the original portrays. Technically, this is also a romance, given the happily ever afters that come with it, but there’s nothing customary or treacly about the way Lackey manages that conclusion.